Emergency Plumbing Services - T.Webber Plumbing, Heating, Air & Electric. Is your comfort on the rocks? Let us sprint to the rescue. 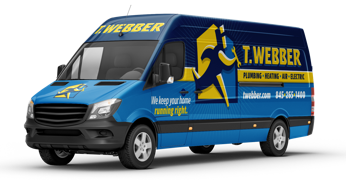 At T.Webber, we understand plumbing emergencies happen at the most inconvenient times. Whether it’s a weekend, holiday, or the middle of the night when an unexpected issue arises, you need an experienced professional to call on. You can count on T.Webber to provide comprehensive emergency plumbing services throughout the Hudson Valley, including Dutchess, Putnam, Westchester, Orange & Ulster County. Our team of professional plumbers is available all day, every day to ensure you have the service you need – when you need it most. Every emergency plumbing call begins with a thorough diagnostic to determine the root cause of your issue. Once identified, our Plumbing Experts will let you know exactly what is going on, how we can fix it, and what the complete up-front rate will be. With your approval, most all repairs can be completed during the initial visit. It is our goal to provide you with a rapid-response to your emergency, and ensure your issue is resolved with the utmost professionalism and care – whether its 2:00pm or 2:00am! Need immediate assistance? Our plumbing experts are always on the run to ensure our customers are satisfied with their home comfort. Call T.Webber today to see how we can help.